A few weeks ago, I got the itch to decorate our outside doorway arguably prematurely, but did it anyway (what do you call this area? 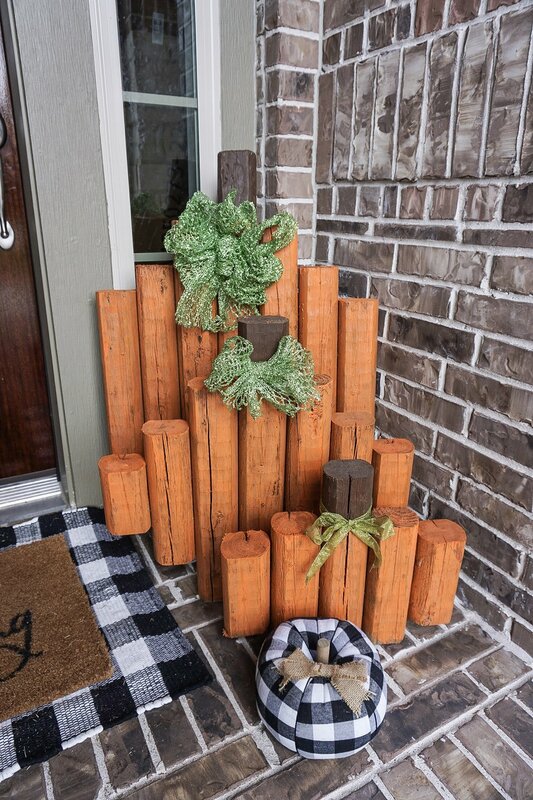 outside entryway? front door area? whatever, you know what I mean). Home Goods has had their fall decor out for weeks and I’ve been eyeing it, eager to get my hands on some pumpkins and I finally gave in to the urge. Us Houstonians seem to be abnormally obsessed with all things fall, especially considering we don’t actually have a fall. Maybe that explains it- fake it til you make it. If we pretend it’s chilly outside with foliage on the ground, maybe it will actually happen one of these days. Like, say, early December. I searched high and low for a wreath that wasn’t $60+ and even at Home Goods and TJ Maxx, they were pretty pricey. I don’t like anything too orangey, if that makes sense, and was surprised to find this wreath at Walmart for under $20. I added some gingham ribbon (found in the Christmas section at Hobby Lobby) to tie it in to the rest of the decor. I’ve gotten more questions about the gingham doormat than anything, which is currently on sale at Hobby Lobby for $10 in the fall decor section. I bought 2 because I know this one will get dirty and I want a back-up for the holiday season! If you don’t have a Hobby Lobby close, here is a very similar option. The gingham pumpkins were also a Walmart find (Hobby Lobby has them too for around the same price)- they have orange and white gingham print as well here. The happy harvest sign came from Home Goods for $20 but I found similar on Etsy, and same for the galvanized planter ($10). The yellow mum came from the garden section at Walmart for around $10 and I eventually want to add a few more to our porch area that you can’t see in these pictures- it’s to the right of the doorway and still needs some sprucing up. We have an old white bench there now that I need to put some pillows on and maybe add a little table. I can’t wait to drink coffee there in the mornings when the weather does finally cool off! We’ve had the baby sleeping doormat for awhile and it’s been a lifesaver through lots of UPS deliveries and workers fixing things on the house- would also be such a great shower gift! As far as the wooden pumpkins, there are also some similar ones on Etsy here if you’re not into crafting. But if you are, sharing how Z whipped them up below! ”I used 8 ft. landscaping timber or posts ($3) and first cut a long stem part. I don’t know measurments- it’s just however tall you want the pumpkin to be. Next I cut the wood in pairs for each side, making each pair shorter than the last. I laid all the boards out and cut 2 two by fours the width of the pumpkin and nailed the boards to the back of the pumpkin (in hindsight I should have screwed them instead of nailing since they’ve been used so much). Painted them and done”. As far as measurements go, I don’t think they have to be precise at all since they pumpkins are supposed to look rustic and farmhouse style, not perfectly symmetrical or flawless. Any little mistake in crafting just adds to their charm! Speaking of mistakes, I actually painted the pumpkins myself- the easy and fun job. Which again doesn’t have to be perfect at all (thank goodness), and then just tie some green mesh ribbon for a leaf “bow” and you’re set! I hope that makes sense as far as the pumpkins go- if you have any questions at all just leave them in the comments and I’ll (get Z to) answer them for you. Thanks for stopping by!